Impact Wrestling tonight will feature an X-Division Championship match. 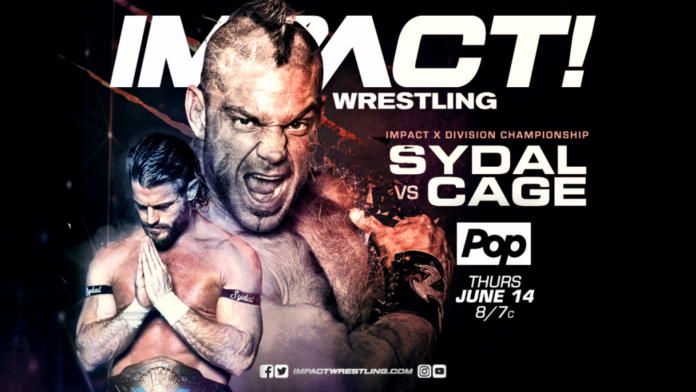 Brian Cage, who is undefeated for the promotion, will challenge X-Division champion, Matt Sydal. Moose and Eli Drake will also clash with the winner receiving a title shot against Austin Aries at Slammiversary. The promotion is beginning the build to their Slammiversary pay-per-view on July 22nd, 2018 from Toronto’s Rebel nightclub. Cage earned this match by defeating Dezmond Xavier on a previous episode of Impact. Lately on Impact, the promotion has been showing footage of Cage wrestling from promotions all around the world. He’s wrestled for companies such as Destiny, World Series of Wrestling, and Pro Wrestling NOAH. Sydal most recently defended the title successfully against El Hijo Del Fantasma. He won the title from Taiji Ishimori, who is also booked for Slammiversary despite now wrestling for NJPW as well. Two women in their early-20s just starting to get their careers going will clash tonight with no DQ. Blanchard wants to bounce back from her recent loss to Madison Rayne. ImpactWrestling.com notes the winner of this match could be in a position to challenge Su Yung for the Knockouts title. The winner of this match will earn the right to challenge Austin Aries for the Impact World Championship at Slammiversary. As for the champion, he is likely still on vacation this week. That’s where Aries was last week when Josh Matthews conducted a Skype interview with him. Aries has been on vacation since defeating Pentagon Jr for the Impact World Championship at Under Pressure. Fallout from Sami Callihan and Eddie Edwards’ “Fight in the Woods”. Also in Impact news, the company’s One Night Only PPV event “Zero Fear Friday” airs tomorrow. That show featured Austin Aries facing Rich Swann, Sami Callihan vs Josh Alexander, Matt Sydal vs Dezmond Xavier, Su Yung vs Katarina, Madison Rayne vs KC Spinelli, and Eddie Edwards vs Trevor Lee.